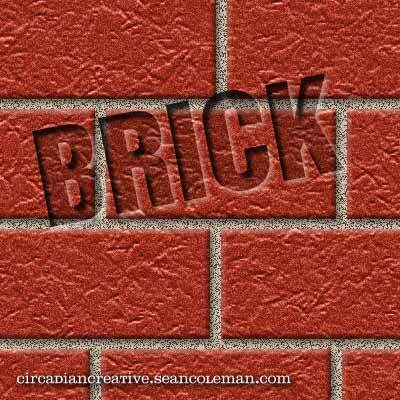 Today’s texture is brick. Sorry I don’t have a lot to say about the textures. Short of going into a step by step Photoshop tutorial, there is not much to say about them. Hope you like. Tomorrow I will start posting the “book covers” series of designs. These will not be designs for actual book cover’s, necessarily. The designs will be inspired by some vintage mid century book cover designs that I discovered a while ago. You can look at them here. The basic idea for the coming designs will be basic shape and illustrations combined with typography. I have also created a Facebook page to promote this website. If you are interested you can click here and visit and click the like button to add it to your pages. Hope everyone is enjoying their Memorial Day weekend. Thanks for stopping by and I’ll see you all again tomorrow! 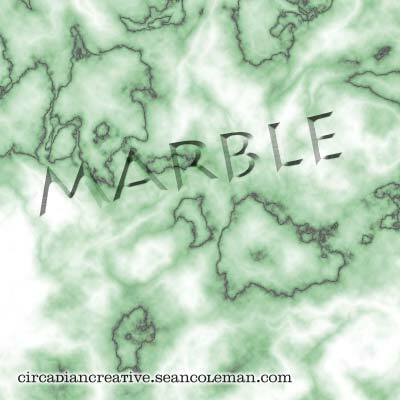 Today’s texture is marble. I think I was inspired by my visit in to Washington D.C. yesterday. We didn’t go all the way down to the mall and monuments areas but we saw some marble none-the-less. This is a fairly simple effect created in Photoshop. Hope you enjoy. See you all tomorrow with the final basic texture design. 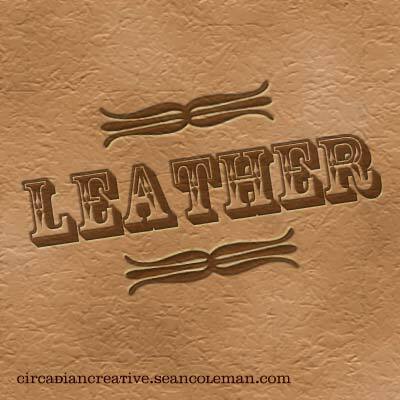 And then I will start creating book cover designs based on simple words and phrases. This book cover project will incorporate the basic concepts I’ve been working on up to this point to create comprehensive designs. Feel free to contribute your words or phrases in the comment area below. 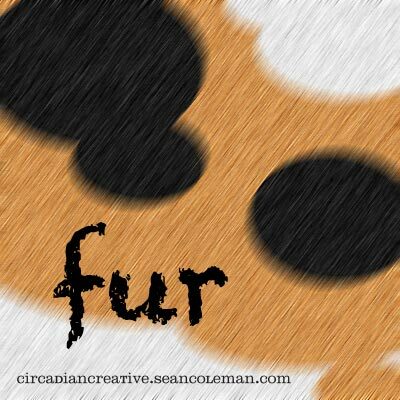 Today’s texture is fur. I used Shelby, our calico cat as inspiration. I love the color combo but I’m sure there is a better technique to create a more realistic fur texture. perhaps I will experiment and come up with something better in the future. Have a great day and I’ll be back tomorrow with another texture. 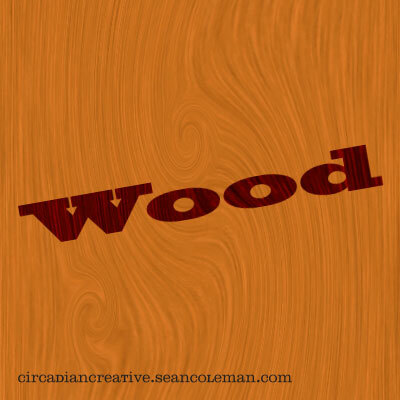 Today’s texture is wood. Again, I don’t have anything exciting to say about it. I do like it an I hope you do to. Have great evening and I’ll see you all back here tomorrow. 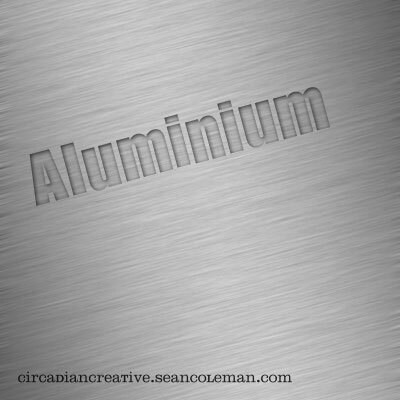 Today’s texture is brushed aluminium. Again, I am at a lose for words on this one. I like it. I used the British spelling of the word because I like to pronounce it that way – alumin-e-um. Fun. I also think it turned out fairly realistic and it is also easy to recycle. Hope you like. Today’s texture is one of my favorite. Glossy, shiny, whatever other adjectives you would like to use. This effect is easily accomplished with software and generally creates a lovely result, and sometimes a wow factor, in any design. I was inspired by a hi-gloss, black paint job on a classic car. 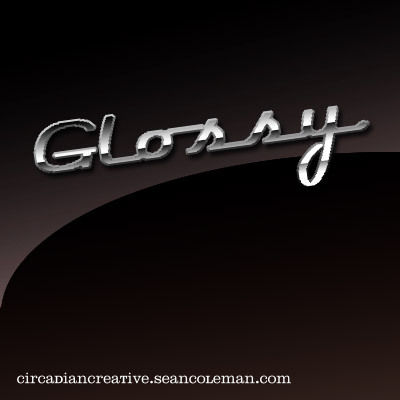 I chose a retro display typeface to represent the word “glossy” to enhance that classic car feeling, applying the same “glossy” techniques to create a chrome logo or name plate. I am imagining myself cruising through the evening desert in a 57 Thunderbird or Corvette right now. Route 66, here I come! Don’t worry, I’ll be back tomorrow. Vrrrooom Vrrrrooom!